Cushing’s Disease in Scottish Terriers (and other breeds) is a common endocrinological disorder in dogs. In humans though, CD is rare. The clinical presentation of CD is however, is highly similar between both dogs and humans with characteristic signs such as abdominal obesity, weight gain, fatigue, muscle atrophy, and skin changes. 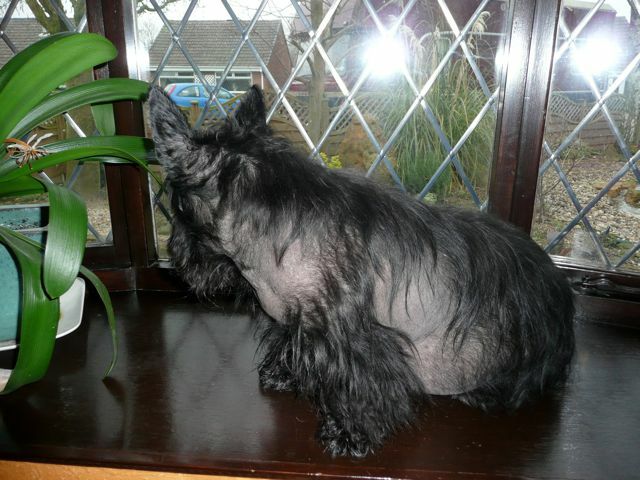 Cushing’s Disease in Scottish Terriers and other dogs, is probably very easily overlooked by many Scottie dog owners as it is usually only associated with the elder Scottie and we therefore tend to think that it is the onset of old age. Cushing’s disease (hyperadrenocorticism) in dogs is a condition that results from the chronic overproduction of too much glucocorticoid in the body. In the normal dog, the pituitary gland produces a hormone called ACTH, which stimulates the adrenal gland to produce the glucocorticoid hormones necessary for the function of many systems in the body. If something goes wrong in the pituitary gland or adrenal gland and too much glucocorticoid is produced, then Cushing’s disease develops. This is a very complicated disease with a wide range of symptoms and causes. This article will try to give a concise description of the disease, its symptoms, how it is diagnosed, and its treatment. Cushing’s disease is considered a disease of middle age and older dogs and cats. It is much more common in dogs. This disease is similar in cats except that in cats up to 80% also have concurrent diabetes mellitus. This article will refer to the problem as it occurs in dogs. The usual age of contracting the disease is around six or seven years with a range of two to sixteen years. There is equal distribution between males and females and there does not appear to be an increase of the disease in any one breed. What are the symptoms of Cushing’s disease in dogs? As a result of the chronically elevated glucocorticoids (steroids), the affected dogs develop a classic combination of dramatic clinical signs and lesions. The disease progresses slowly. A study showed that most dogs had at least one symptom of the disease from one to six years before the disease was diagnosed. Because the symptoms occur so gradually, the owner often attributes the changes to “old age.” Some dogs will have only one symptom, while others may have many. Increased Water Consumption and Urination: The most common symptom is increased consumption of water and the resultant increased urination (polyuria/polydipsia). The dogs drink between two and ten times the normal amount of water and the resultant increase in urination follows. This symptom is present in over 85% of all animals with Cushing’s disease. Previously housebroken animals may begin to have accidents because their bladders fill quickly with the overproduction of urine. Increase in Appetite: Increase in appetite (polyphagia) is another common clinical symptom that shows up in around 80% of the affected animals. Dogs may begin stealing food, getting into the garbage, begging continuously, and become very protective of their food. Despite having other symptoms, the owner may feel that the dog is okay because of his good appetite. Abdominal Enlargement: Abdominal enlargement is a common symptom in up to 80% of the affected dogs. The potbellied appearance is a result of the shifting of fat to the abdominal area and a weakening and wasting of muscle mass in the abdomen. Hair Loss and Thin Skin: Hair loss and thinning of the skin are also common symptoms in dogs with Cushing’s disease. It is estimated that between 50% and 90% of the affected animals develop these symptoms. Hair loss (alopecia) is one of the most common reasons that owners bring their dog in for evaluation. The hair loss usually starts over the areas of wear such as the elbows and progresses to the flanks and abdomen until eventually only the head and extremities have hair. The skin may also become thin and be easily damaged and slow to heal. Increased panting, recurrent urinary tract infections, or losses in reproductive ability are other symptoms often noted with this disease. There are two different distinct forms of the disease. There is pituitary dependent hyperadrenocorticism (PDH) and there is an adrenal-based disease. Pituitary dependent hyperadrenocorticism: PDH involves the oversecretion of ACTH by the pituitary gland. ACTH is a hormone that stimulates the adrenal gland to produce glucocorticoids. The pituitary gland is most likely overproducing ACTH because of a pituitary tumor. The PDH form of the disease is responsible for around 80% of the cases of canine Cushing’s disease. Adrenal-based hyperadrenocorticism: The adrenal-based form of the disease is usually a result of an adrenal tumor that causes an oversecretion of glucocorticoids. Adrenal tumors are responsible for around 20% of the cases of Cushing’s disease. There is also a form of the disease called “iatrogenic” Cushing’s disease that occurs as a result of giving the animal high doses of steroids. In this form of the disease, symptoms of Cushing’s disease will go away once the steroids are discontinued. It is recommended that any dog suspected of having Cushing’s disease should have a complete blood count, chemistry profile, and urinalysis performed as a routine part of the evaluation. Cushing’s disease can present with a variety of symptoms and may also be involved with several different disease processes. Therefore, it is recommended that any dog suspected of having Cushing’s disease should have acomplete blood count (CBC), blood chemistry panel, andurinalysis performed as a routine part of the evaluation. Common abnormalities in these tests include increases in alkaline phosphatase, and ALT (liver enzymes), increased cholesterol, decreased BUN (a kidney function test), and dilute urine (low specific gravity). There are several different tests that can be performed to get a definitive diagnosis of Cushing’s disease. Many times the veterinarian may perform more than one test to help confirm the diagnosis or to determine which form of the disease is present. A diagnosis of Cushing’s disease, however, should never be made on the basis of laboratory tests alone. The dog needs to be showing symptoms of the disease, and have a medical history consistent with the diagnosis. The three most common “screening” tests are the urine cortisol:creatinine ratio, the low dose dexamethasone suppression test, and ultrasound. Urine Cortisol:Creatinine Ratio: In this test, the owner generally collects a urine sample at home (where the animal is not stressed). The sample is sent by the veterinarian to a special laboratory for testing. Most dogs with Cushing’s disease have an abnormal result. However, there are other diseases that can also cause abnormal results. So if this test is abnormal, further diagnostic testing should be performed. Low Dose Dexamethasone Suppression Test: The low dose dexamethasone suppression test is useful in diagnosing Cushing’s disease in dogs. When given low doses of dexamethasone, normal dogs show a marked decrease in blood cortisol levels when tested 8 hours later. Most dogs (more than 90%) with Cushing’s disease do not have a decrease in cortisol level after being given dexamethasone. The results can sometimes help determine which type of disease is present. ACTH Stimulation Test: This is another test that is commonly used in the diagnosis of Cushing’s disease today. It will not distinguish between the two types of hyperadrenocorticism, but it may aid in the diagnosis in difficult cases. It is also used to evaluate the effectiveness of therapy. Abdominal Ultrasound: Abdominal ultrasound is helpful in three respects. First, it is a good test to evaluate all of the abdominal organs in the dog. Secondly, it is used to study the size and shape of the adrenal glands. 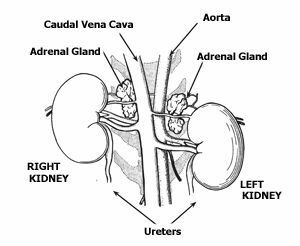 The adrenal glands in pituitary dependent hyperadrenocorticism are usually normal in size or enlarged. If a tumor is present however, one adrenal gland is often abnormally large or of uneven shape. Finally, if a tumor is suspected, ultrasound can help identify any metastasis to other organs. High Dose Dexamethasone Suppression Test: This blood test, which is not used often, may help to is used to distinguish between pituitary dependent hyperadrenocorticism and adrenal-based hyperadrenocorticism. Treatment consists of several different options. Depending on the type of disease, surgery can be performed. If an adrenal tumor is identified, then surgical removal may be a viable option. There are several different forms of tumors that can invade the adrenal gland and their treatment will be based on the particular tumor type. Non surgical treatment is the most often used treatment for most cases of canine Cushing’s disease. About 80% of the cases of Cushing’s disease in the dog are of the pituitary type, and since both the adrenal and the pituitary type will respond effectively to some of the oral treatments, many veterinarians do not perform the diagnostics necessary to distinguish between the two different forms. There are currently several different oral medications being used to treat canine Cushing’s disease. Nonsurgical treatment is the most common treatment for canine Cushing’s disease. Lysodren: Until recently, Lysodren (also known as mitotane, and o,p’-DDD) was the only treatment available for pituitary dependent Cushing’s disease. It is convenient to use and is relatively inexpensive and is still probably the most widely used treatment. The downside of this drug is that it can have some serious side effects and regular blood-monitoring needs to be performed. During the initial phases of the therapy, the dog must be very carefully monitored, and there must be close communication between the veterinarian and the owner. The use of Lysodren is somewhat like chemotherapy. It works by destroying cells of the adrenal gland that produce the corticosteroid hormones. As the number of corticosteroid-producing cells is reduced, even though the pituitary gland continues to produce excess ACTH, the adrenal gland is less able to respond, so the amount of glucocorticoid being produced is reduced. The problems arise when too much of the adrenal cortex is killed off. The animals may then need to be placed on prednisone, either short or long term. The Lysodren is initially given daily while the animal is being monitored for a decrease in the symptoms (water consumption, appetite). On the 8th or 9th day of the initial therapy, the dog needs to be examined and an ACTH stimulation test is performed to determine if the drug is working. If the goal is achieved, maintenance therapy is started. If the goal has not been reached, then the dog generally remains on the daily medication for 3 to 7 additional days and is rechecked until the proper results are achieved. If the dog becomes lethargic, vomits, or has diarrhea, or if the treatment does not work by 30 days, then the treatment plan is reevaluated. If treatment is successful, then symptoms should resolve within 4 to 6 months. A certain percentage of dogs will relapse and need to undergo the daily therapy again at some point in their lives. If a dog ever becomes ill while on Lysodren, the Lysodren should be stopped immediately and the dog should be examined by a veterinarian. If the therapy is successful, the dog will need to be on Lysodren for the rest of his life. Trilostane: Trilostane is a newer treatment that is used to treat some dogs with Cushing’s disease. It is more expensive, but may be an alternative treatment for dogs with adrenal tumors. As with Lysodren, the dog is reexamined repeatedly during the initial phase of treatment, and ACTH stimulation tests are performed. In many cases, after several months of therapy the dose needs to be increased. Ketoconazole: Ketoconazole is an oral antifungal agent that has been used extensively since the mid 80s. One of the side effects of ketoconazole is that it interferes with the synthesis of steroid hormones. It therefore gained some popularity as a treatment for Cushing’s disease. However, it is rarely used today. L-deprenyl (Anipryl): L-deprenyl (Anipryl) has been advocated for the treatment of Cushing’s disease in dogs, but its effectiveness has come into question. Cushing’s disease is a disease that affects middle age to older dogs. The affected animal has a characteristic presentation including increased water consumption and resulting increased urination, increased appetite, hair loss, and a potbellied appearance. There are several diagnostic tests available, as well as several treatments. Bonagura, J. Kirk’s Current Veterinary Therapy XII. W.B. Saunders Co. Philadelphia, PA; 2000. Feldman, EC. An update on the diagnosis of Cushing’s Syndrome in Dogs. Presented at the Wisconsin Veterinary Medical Association Convention, Madison, Wisconsin, October 2005. Feldman, EC. Treatment of hyperadrenocorticism in dogs. Presented at the Wisconsin Veterinary Medical Association Convention, Madison, Wisconsin, October 2005. Ramsey I, Neiger R. Canine hyperadrenocorticism. In: Bonagura JD, Twedt DC (eds.) Kirk’s Current Veterinary Therapy XIV. WB Saunders Co, Philadelphia, PA 2009:2224-227.